Retained executive search is a specialized form of management consulting where organizations engage a professional consultancy to conduct a structured search and selection process to recruit for critical senior management positions. Since many international corporations have established a business presence in China, the demand for qualified management professionals has rapidly increased over the years and the executive search market in China is expected to grow at double-digit rates each year until 2020. With a population amounting to 20% of the world population, a multinational company looking to recruit Chinese executives may believe that there would be a vast local talent pool available. That is not the case at all. According to several leading corporate HR professionals and executive search consultants in China, there is a deficit in the country’s availability of executive talent. 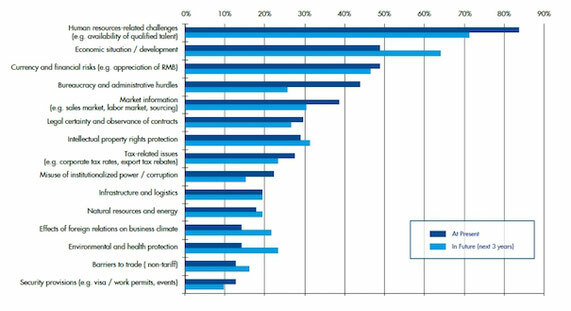 What are the biggest HR-related challenges for multinationals in China? How can international firms overcome these challenges and attract, develop and retain the brightest executive talent in China to stay ahead in the war over talent? What is the difference between a contingent recruiter and a retained search firm and how do they address the executive recruitment and talent management challenges in China? Since initiating market reforms in 1978 China underwent a remarkable period of rapid growth and has recently emerged as the second largest economy in the world. With a population of over 1.38 billion and a working-age population of 72% China is capitalizing on immense human resources. China now has a large college graduate population of about 7-8 million graduates every year, so they have an enormous amount of new labor force. Nevertheless, many multinational companies face difficulties in attracting, developing and retaining local Chinese talent needed to expand their business operations in the country. International firms realize the importance of having local leadership in tune with the peculiarities and rapidly changing market conditions of the Chinese market. According to a study conducted by the German Chamber of Commerce in China human resources challenges continue to top the list of business challenges for foreign companies doing business in China. These challenges are dominated by topics such as finding and retaining qualified talent and increasing labor costs. As is the case in many other developing countries, the HR profession is still evolving in China. Only until a few years ago the HR function was limited to administrative tasks such as recruiting, dismissal, and paying taxes and benefits. Talent management, training and organizational development are comparatively new concepts. That makes identifying and attracting qualified HR professionals a huge challenge. And while the situation is rapidly improving, it remains difficult to recruit strategically thinking and people-oriented HR executives. One of the main reasons why multinationals are driven to recruit local executives is to gain access to knowledge of new regions. In China this has driven many multinationals to reduce the number of not Chinese executives. Over the past three to four years experience from leading executive search firms suggests that approximately 55-60% of multinational companies have replaced foreign expatriates with local executive hires. Pankaj Ghemawat, a professor at IESE business school, has conducted research of the impact of “cultural distance” on business and found greater challenges where companies operate across regions that lack historical and cultural overlap, as is the case with European and U.S. companies operating in China. Corporations that are successful in other markets, including Walmart and The Home Depot, have failed to understand China's unique consumer habits and culture. The concept of cultural distance has inspired significant changes in the business practices of foreign companies in China, ranging from marketing and product design to government relations. Beyond simple focus groups and market studies, companies require senior executive talent who is able to understand the local needs, run the business accordingly, and work in close cooperation with the headquarters and business entities around the world. Although lower labor costs are commonly cited as a benefit of staff localization, this is often true only for entry- and mid-level management roles. Local Chinese hire typically represents only one third of the cost of an expatriate. However, following the rise in average income and the appreciation in the Chinese currency, this gap has begun to close. As the competition for top local talent is intensifying, the best Chinese managers may become just as expensive as their foreign counterparts. Despite acknowledging the clear need to localize, multinationals sometimes struggle to achieve this due to a shortage of local talent. McKinsey referred to this as “the supply paradox” because it is difficult to find acceptable hires despite having so many college educated applicants. The consulting company predicted a looming war over talent, suggesting that less than 10% of job candidates would be suitable for work in a foreign company. Recruiting is also difficult because some find that the best students do not always make the best employees. Some multinational companies therefore prefer not to hire recent graduates from top-tier Chinese universities, but go with candidates from second-tier and regional universities who have often gained more practical working experience and show more ambition. The quality of management talent is on a path of significant improvement, which can be attributed to broader educational and employment opportunities. Firstly, an increasing number of Chinese are studying overseas. 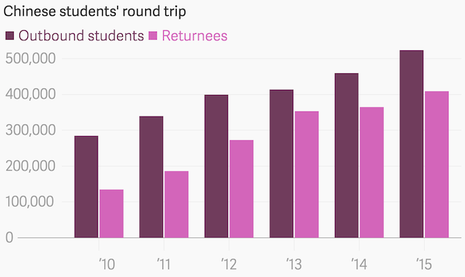 In 2015 more than half a million Chinese students were studying abroad, 14% more than the previous year. Secondly, management education is both improving and becoming more aligned with established practices: The China Europe International Business School recently lured its new dean from Harvard Business School in an effort to reform its faculty, branding, fundraising and school culture. Similarly, Peking University’s Guanghua School increasingly uses course materials from Harvard Business School and London Business School. Finally, with the growing presence of multinationals in China the pool of local managers familiar with multinational practices has expanded. As a result both the quantity and the quality of management talent in China are improving. Yet demand for top talent continues to outpace supply for three main reasons. Firstly, more foreign companies are deepening their commitment to, and presence in, the Chinese market. Secondly, multinationals are seeking to increase the proportion of local executives in their organizations. Thirdly, taking advantage of the rapidly growing Chinese market often requires a breakneck pace of expansion, requiring more managers of increasingly higher caliber. Over the last decade mainland Chinese companies have been competing more fiercely with multinational corporations for senior business executives. Chinese companies are expanding their operations and revising their business models to challenge their foreign rivals. In addition, some new foreign entrants into the Chinese market have poached talent from local firms and MNCs as an expedient alternative to developing talent internally or seconding talent from overseas. Especially private Chinese enterprises are snapping up a greater share of the top talent pool by means of attractive offerings. With the right qualification background a middle-level Chinese manager at a multinational would likely find higher income and increased responsibility at a local firm. For example, a deputy manager in a large multinational corporation might become the general manager of a publicly listed Chinese company or the junior partner at a local private equity fund, helping growth-stage companies run their operations. For proven managers there is often a generous selection of alternatives driving higher turnover. The traditional advantages of multinational companies in attracting talent through renowned brands, a higher level of compensation and career development opportunities are constantly eroding. According to a survey of Chinese job seekers conducted in 2014 just 21% of Chinese university students polled said that they wanted to work for an international organization after graduation, down from 38% in 2013. Besides, an increasing amount of Chinese university graduates are interested in working for startups, which is 18% this year compared to 6% last year. This competitive talent market which has resulted in fierce poaching of top local talent has put an upward pressure on salaries. The average wages for executives across all levels at multinationals operating in China have risen by more than 7-8 percent in 2015. In addition, executive candidates usually expect an additional 15-25% salary increase to move to a new company. Salaries for senior executives may not be compared to standard industry benchmarks, but reflect whatever sum may be needed to convince them to leave their current positions. The attractiveness of outside opportunities is furthermore nurtured by the frustrations that Chinese executives sometimes feel while working for a multinational. Given that they often report to foreign managers who are less familiar with the local business practices and rapid changes in the Chinese market, local executives feel that much of their time is spent translating for foreigners. External opportunities can become more enticing if local executives feel limited by operations that are not sufficiently adopted to the needs of the local market. Another challenge that many multinationals are facing is that formal support systems to identify and promote local managers are still immature. As a result local employees may at times see a glass ceiling that restricts their promotion opportunities within a multinational. Along with the increasing competition for top local talent these issues of communication, mutual trust, working style, and career trajectory are major challenges to attracting Chinese managers and building a strong local management team. Language is a commonly cited barrier for multinationals in China. With English still considered the international language of business, multinationals often feel that Chinese managers should improve their English language skills to be able to function effectively - and express themselves persuasively - in a non-native tongue. While many leaders excel at these soft skills in a first language, it is significantly more difficult to carry the same leadership presence in one’s second, third or fourth language, further detracting from the confidence of company heads in their multinational’s home country. Cultural norms and working styles are equally important. Chinese managers tend to operate more comfortably in clearly hierarchical structures, as opposed to more open and flatter collaborative office environments. As one executive at Microsoft noted, “Chinese managers might have trouble managing upwards within multinationals when needing to challenge authority, express divergent opinions, and take risks". Finally, multinationals in China point out difficulty with geographic mobility. Family ties and cultural obligations to care for one’s parents may cause executives to oppose relocation. Renowned multinational firms are usually able to recruit heavily from universities in Beijing and Shanghai, but struggle to staff executive positions in northern China. While seeking international exposure, the Chinese are sometimes reluctant to leave China due to rapid changes in the market and fear of missing out on opportunities for growth. Rotating assignments across geographies, considered crucial in career development at some multinationals, often incurs high career and family opportunity costs for local executive talent. Expatriate compensation packages are swelling in China as the rising cost of living and increased pollution make it more challenging to attract and retain international executive talent. Mainland China climbed to the fourth place and overtook Hong Kong in the latest ranking of expatriate pay packages within the Asia-Pacific region, a recent survey by consulting firm ECA International showed. The consulting firm polled 320 companies across 167 countries, covering about 10,000 expat packages. 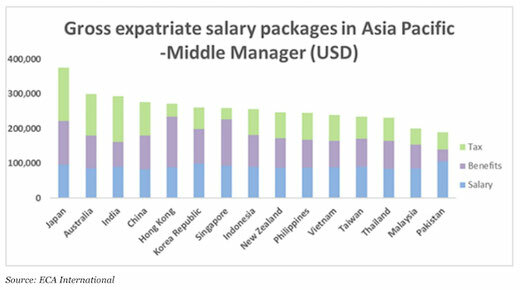 A total package for an expatriate middle manager in Mainland China is now worth over 276,000 USD per year on average, making him one of the highest-paid expatriates in the world. In Hong Kong the package is around 272,000 USD per year, slightly lower than in Shanghai and Beijing. Though cash salary figures were not presented separately, a graph of the breakdown of the packages shows that noncash benefits and tax represent more than half the total package. However, far from all Chinese cities require such high packages. The cost of benefits provision in tier 2 cities is still much lower than in tier 1 cities and if those cities alone were to be taken into account, Mainland China would appear towards the bottom of the regional ranking above only Malaysia and Pakistan. The cost of an expatriate package is determined by three main elements: cash compensation; additional benefits such as housing allowance, international school tuition, transportation and other non-cash benefits; and tax. Higher salaries and increased benefit costs as well as stronger Chinese currency may explain the rise of China in the rankings. 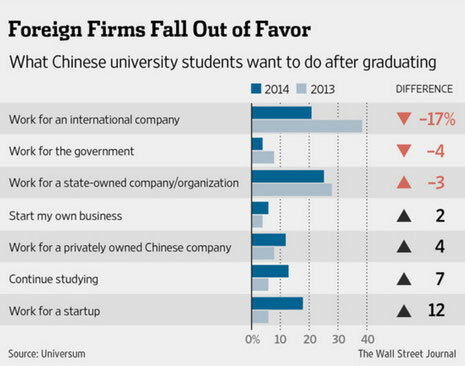 But employees also find it increasingly tough to attract international talent to China. In 2014 twice as many expats moved out of China as into the country, according to a study by UniGroup Relocation, which moves over 260,000 families per year worldwide. The outflow could be pegged to expiring work contracts which typically tie expats to China for two to three years. There are other factors too, such as rising costs of living, concerns over food safety and air pollution, and the desire to reengage with the home office. The trend is also partly driven by a shift in global economic winds. China’s slowest growth since 2009 – which leaders have taken to calling the new norm – has cut into multinationals’ sales, forcing some to reconsider their operating strategies in China. With manufacturing and labor costs rising in China, some corporations are skipping the Middle Kingdom altogether for cheaper pastures such as Malaysia and Vietnam. The economic recovery in the U.S. and in some parts of Europe is another factor drawing expatriates out of China. For expatriates moving out of China the U.S. was the No. 1 destination, followed by Germany, Singapore and France. Hong Kong and Malaysia, the only Asian regions in the top 10, ranked sixth and 10th. While U.S. executives and other multinational managers may be leaving, the country has seen a recent influx of younger workers, many of whom move to China on their own and thus wouldn’t show up in UniGroup’s statistics. Besides the U.S. the top economies sending people to China were Hong Kong, the Netherlands, and Singapore. The bulk of these moves was by employees in the service industry – banking, hospitality and pharmaceuticals. With that said, China remains a popular expat destination. The HSBC Expat Explorer Report 2014 showed that China is the third most desirable destination for expatriates behind Switzerland and Singapore. China is the best place for expats looking to make their money go further, with 76% of expats in the country experiencing growth in their spending power once they’ve moved. The survey showed that about a quarter of expats in China make more than 300,000 USD in an annual package, the highest proportion of any country. Expat jobs especially in demand in China include banking and financial services, sales and marketing, human resources, advertising and communications, manufacturing and industry, health sciences and IT according to Expat Arrivals, a website supplying destination information. In response to these challenges leading multinationals have developed internal initiatives to address these issues and provide more attractive career-development platforms for local top talent. Multinationals use a variety of programs to lure and retain China’s best and brightest executives. These initiatives include global rotations, internal trainings, monetary incentives, and collaborative curriculum building with local universities. Microsoft, for example, uses two methods to give Chinese managers international exposure. The first method brings top U.S. managers to China to work side by side local executives and provide individual coaching. The second method, which is sometimes referred to as a “reverse expat” program, sends Chinese executives to the U.S. for several months to gain deeper understanding of headquarter operations and absorb valuable experience of working in a foreign environment. Creative problem solving and critical thinking are often considered the two fundamental skills of a local manager which are a clear development area in the Chinese education system. Many firms note their involvement with local universities either through collaborative curriculum building and/or sponsoring, or through participating in industry events, such as case competitions and panel discussions. Companies also consistently point to their advocacy for more rigorous general management training. Multinationals are clearly emphasizing the significance of localizing their organizations in China, but the talent management challenges are formidable. Top local talent is scarce but critical. Chinese companies, rather than multinationals, are becoming more attractive places to work at. In addition, China’s “cultural distance” from the home countries of many multinationals operating in the country is great. Several multinationals have left China because they could not successfully navigate through these issues. For the multinationals that remain, talent management, specifically recruiting, developing, and retaining local executive talent in China’s large complex and rapidly growing economy, has over the past decade been, and will undoubtedly continue to be a major focus for success. When international companies operating in China seek to attract management and professional talent from outside their organization, they have various options. They can decide to manage the process internally by posting job advertisements and leveraging their networks or they can outsource the recruitment process to a professional search consultant. If they decide to work with an external service provider, they can either engage a contingency recruitment or a retained executive search firm. Why might organizations face limitations of managing the recruitment process in-house? What are the differences between contingent recruiters and retained search consultants? How will these different recruitment approaches affect your business in China? There are several limitations associated with managing the recruitment process internally. First of all many qualified candidates, including some of those most qualified, are not actively looking for new career opportunities and might not respond to a job advertisement. Only about 25% of the total workforce is actively looking for new career opportunities, whereas passive candidates account for 75% of the total working population. The potential of reaching out to a large pool of passive candidates can only be achieved by following a structured and time-consuming active sourcing strategy. Except a few large multinational organizations which have built up a team of qualified active sourcing professionals over the years in China, most small and mid-sized businesses do not have the internal resources and experience to effectively approach and attract these candidates. A common complaint we hear from in-house recruiters in China is also the number of unqualified candidates they receive from job postings, and they need to invest in screening plenty of resumes. Once qualified candidates have been identified, companies are confronted with a time-consuming negotiation process. Outsourcing this responsibility to a professional search consultant allows your organization to focus on its core business and can create competitive advantage by reducing fixed overhead costs while speeding up the recruitment process and increase the quality of the candidates. As a result, organizations might choose to engage an external professional recruiter. But how do they decide whether to use a contingency recruiter or a retained executive search firm for their hiring needs in China? Retained executive search consulting and contingency recruiting are unfortunately often thought of interchangeably when they are indeed completely different professions. This is especially the case in China where the strategic importance of the HR function is still evolving. For most HR professionals in China, the main difference between a contingency recruiter and a retained executive search consultant appears to be simply an issue of how the recruiter gets paid. A contingency recruiter will only get paid if a candidate is hired. For engaging a retained search consultant the client will pay a proportion of the fee upfront. That difference dictates a completely different approach of searching for a suitable candidate. A retained executive search firm operates on an exclusive client-centered basis and works on a limited number of search assignments at a time to ensure a speedy delivery process while maintaining a high level of quality. They will invest all their resources and dedicate their research capacity on each search assignment while leveraging the full spectrum of active and passive candidates available on the market and often find candidates with unique backgrounds. Retained executive search professionals represent your business in a confidential manner and will be engaged in all aspects of the search process, starting from defining a tailor-made search strategy through candidate integration. Their goal is defined by providing their client with a selection of highly qualified candidates that have the right background and experience for the specific job opportunity and fit well with the clients' culture. Their success is based on long-term commitment and impact of the person hired, therefore they are motivated to help secure a lasting, successful executive hire for their clients. Retained executive search firms in China are typically foreign-invested search firms who are used for mid to senior level executive or advanced specialist positions which require a unique set of skills. Assignments are generally for positions where the best candidate is difficult to find and hard to persuade to make a move, and where the potential impact of a wrong hiring decision will have a significant impact on the future success of the business. If you want to learn more about the steps of a dedicated retained search process read this article. Contingency recruiters typically work with a large number of job openings concurrently and seek to place as many candidates as possible in the shortest possible time. They advertise job postings and use online databases to identify a large number of potential candidates who likely fit the clients' criteria. Resumes are shared with the client who then takes a more hands-on approach to reviewing and evaluating the candidates. By virtue of the payment upon placement nature of this business model contingent recruiters are motivated to get many resumes in front of many clients as quickly as possible. Contingency search follows a volume-based search approach and if a particular assignment is not getting traction, contingency recruiters have little incentive to continue. Fees are generally lower, reflecting their limited scope of work. Contingent recruiters in China are usually local search firms who are most often used for the placement of junior management positions or positions where there are a large number of qualified candidates available in the Chinese market. They focus on candidates actively looking for a new role and positions that have a lower potential impact within the client organization. International companies with business operations in China make hiring decisions and select recruitment service providers based on a variety of factors that are important for their specific needs. Critical factors in making this choice will include budget restraints, management style, confidentiality, competitors, skill set and market availability, company culture, and the seniority level of the position. When hiring senior level individuals in China, most business leaders, and HR Executives would agree that retained executive search is the fastest, most effective and targeted method of identifying, sourcing and attracting the best candidates. What are the possible consequences of using the wrong type of recruitment service that can harm your business success in China? What about the hidden benefits of engaging a retained executive search firm? Turnover cost has been estimated as high as 150% of the position’s annual salary, which is a lot of money for a senior-level role. So the longer a position is unfilled, the more money is lost. In the long run, retained executive search firms will complete the search more quickly than others and provide more highly qualified candidates. Companies sometimes look for very specific talent requirements in extremely narrow markets. Searching for candidates in such market environment will require a retained search professional with a profound knowledge and network within your industry sector. Contingency recruiters know their chances of a successful hire are limited. This is especially the case if there are a number of other recruiters working on the same job. Therefore, they will not invest optimal resources in your search assignment. If exclusivity for a specific search is not agreed candidates will be approached by several recruiters for the same position. This looks unprofessional and demonstrates to the market that the client is unwilling to invest in a professional and discreet retained executive search service. Any data provided to a local contingency recruiter will be distributed to the market at large. Contingency recruitment firms in China often add resumes to their database without asking for of the candidates' the prior consent. Contingency recruiters are comparatively expensive considering the service they provide. Unlike retained executive search firms whose researchers will systematically screen the talent market in China, they might only source from their passive candidate pool. Retained executive search firms have a wider reach of potential candidates with access beyond people who are actively looking for jobs. An international retained search firm in China typically charges the employer between 25-33%, based on the estimated total annual compensation of the candidate. The fee will usually be split into three equal instalments. So if a retained search firm charges 30% of the annual salary and places a senior manager in China with a salary package of 1,000,000 RMB, the total consulting fee will be 300,000 RMB. Retained search firms usually offer a 6-month guarantee period, which means that they will search for a replacement candidate at no extra cost in case the candidate resigns during the probation period. Contingency search firms in China do not guarantee to fill positions. But if they do, these firms often charge between 20 and 25% of the annual compensation. Some local contingency search firms are even willing to negotiate lower placement fees, but keep in mind that lower fees can reflect in a lower level of effort devoted to your search resulting in a reduced chance of a successful hiring. If the contingent recruiter charges 25% of the annual salary of a senior-level candidate with an annual compensation package of 1,000,000 RMB, a total success-based fee of 250,000 RMB would be charged once the introduced candidate signs the employment contract. These search firms usually do not offer any replacement guarantee if the candidate resigns during the probation period. In this case the hiring company would need to restart the search and pay the full service fees again. Besides the described retained and contingent search model there is another form of executive search which is called delimited search (or engaged search). The delimited search model is a hybrid fee option that adds retainer elements to a contingency model. Similar to retained search firms, delimited search firms require an upfront fee before starting the search assignment. However, the delimited search fee does not follow the typical split of the total search fee into three equal rates. In contrast to a retained search model, a delimited search charges a relatively small upfront fee which is discounted from the final placement fee of 25–35% of the successful candidate's first year compensation. The amount of the initial search fee is non-refundable and will vary depending upon the salary range of the open management position. When deciding which kind of executive search firm to choose it is crucial to understand the different business models and methodologies applied by each service provider. As opposed to contingent placement agencies or in-house recruiting departments retained search firms offer meticulous research, extensive talent pools, and thorough investigations of candidates. If you partner with the right executive search consultancy, the return on your investment will be exponential and the new hire should be able to add value quickly to your organization. By taking advantage of retained executive search you eliminate a lot of the risk involved during the hiring process and it is the most professional and secure method of identifying and attracting the industry’s best high achievers to your organization in China. Ginkgo Search Partners is a leading internationally operating retained executive search and talent management consultancy. Our clients range from large multinational corporations to small and medium sized European and US businesses. We are a true executive search and professional services firm passionately devoted to your success, ethical in our actions, and meticulous in our methods. Doing what is right is at the heart of how we work. We develop deep and meaningful knowledge of your leadership challenges, offer honest guidance, and provide true support. Nurturing long-term relationships with clients allows us to better understand your needs, be positively proactive, and focus on what really matters to you. AESC - How is executive search growing in China? Does your organization seek to attract top executive talent in China? For any specific retained executive search requests in China please fill out the contact form below. Our goal is to respond within 24 hours.